Keeping your work or your home properly organised is a task and a half at the best of times. Throw children into the mix and sometimes it may feel like a job for a team of people, not one or two. With children come immunisation appointments, play dates, doctors and dentists, school plays, clubs, after school activities and more. Trying to keep on top of it all can be quite a juggle. For everything to go as smoothly as possible and to ensure that nothing is forgotten you need to be organised. Thankfully this may be more fun and easier than you'd think. It pays to have one big diary for the home so that you have somewhere that you can put birthdays upcoming appointments, payments, trips and more. A weekly planner keeps you on track but if you have events that are planned months in advance then you need a yearly diary or calendar to note them down. This is a must for any busy household as it will tell you at a glance what is going on and where everyone needs to be and when. We love the brightly coloured and easy to customise and personalise Fiesta Crafts Our Week Weekly Planner for keeping families organised at a glance. It looks fun too so you are more likely to glance at it and be reminded of what is coming up next. Having an area dedicated to being organised is a great idea. Choose somewhere that gets a lot of foot traffic (if you choose somewhere no-one goes very often it may be out of the way but it may also be ignored). Use the chosen place to have your noticeboard, your weekly planner, yearly calendar or diary, a place to sort mail and school / nursery notes and to make sure everything received ends up on the wall planner or similar. 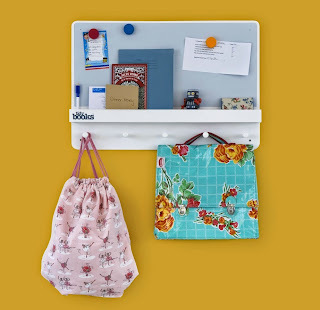 The noticeboard is perfect for pinning school permission slips to, flyers for upcoming events and envelopes with dinner money etc. In order to stay organised make good use of the organisation station and the tools you've put in place there. Keep it clear of clutter so that it is easier to keep on top of and remains a place you want to visit. The same could be said of anywhere in the house. The kitchen especially can be a terrible place for collecting clutter so invest some time in reorganising your kitchen area, throwing out or donating anything you don't need and use tools such as a recipe file to keep cuttings from magazines and similar in one place, keeping your kitchen clear and tidy. Once you have everything the way you want, clean, tidy and have a system in place make sure you use it regularly. Make Friday night perhaps your night for updating the weekly planner with the kids, ensuring you have time to organise over the weekend anything you might need for school or nursery on Monday. What are your top organisation tips for busy families?